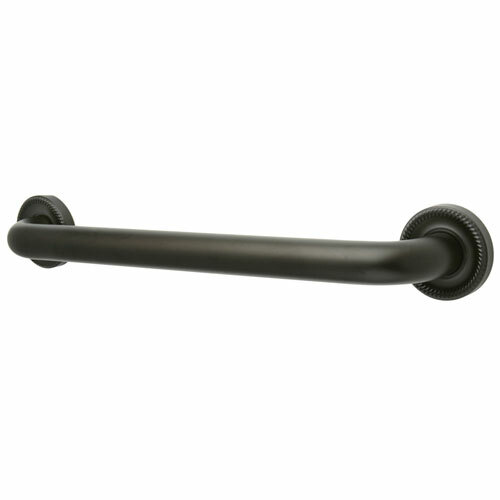 Kingston Grab Bars - Oil Rubbed Bronze Camelon 36-inch Decorative Grab Bar DR914365: This 36-inch Decorative Grab Bar is built to last. The highest quality standards are used to precision manufacturer a top of the line product. Important features of this BRAND NEW Fixture: Complete Item! Everything necessary for installation is included. Matching Accessories Available - Easy to Install - Installation instructions included - 36-inch Decorative Grab Bar - Fabricated from solid brass material for durability and reliability, 1-1/4-inch gripping surface on grab bar, Easy to install, 1-1/2-inch (38mm) wall clearance meets ADA standard, Mounting hardware included (2-inchx#10 Philips Head Screw. Total 6pcs), 36-inch overall length, 1-1/4-inch outer diameter, One Year Limited Warranty to the original consumer to be free from defects in material and finish. - Mounting hardware included - Compliant to ADA standards - 36-inch length - 1-1/4-inch OD - Constructed from solid brass for durability and reliability - Oil Rubbed Bronze premier finish designed to resist fading and tarnishing. This fixture is manufactured by Kingston Brass and is part of their Camelon collection. Fabricated from solid brass material for durability and reliability, 1-1/4" gripping surface on grab bar, Easy to install, 1-1/2" (38mm) wall clearance meets ADA standard, Mounting hardware included (2"x#10 Philips Head Screw. Total 6pcs), 36" overall length, 1-1/4" outer diameter, One Year Limited Warranty to the original consumer to be free from defects in material and finish.